Spain Catalonia: Did Russian 'fake news' stir things up? The Spanish government has accused Russia of spreading disinformation about the crisis in Catalonia. It fears that such outside interference may have contributed to social divisions. Russia denies the claims, dismissing them as "hysteria". Such claims have also been mocked by some Catalans themselves. The EU's fact-checking team - East Stratcom Task Force - has highlighted examples of "disinformation" from Russian-backed media about the situation in Catalonia. Spain declared the Catalan independence vote in October to be illegal and dismissed the region's separatist leaders. Catalan ex-ministers are now awaiting trial on charges of rebellion and sedition. Separatist leader Carles Puigdemont and some allies are in Belgium, in self-imposed exile. The allegations of attempted Russian interference chime with a broader narrative about alleged Russian involvement in Western politics. There are concerns in the United States that social media was manipulated by Russian groups during the 2016 presidential election. UK Prime Minister Theresa May has accused Moscow of meddling in elections and carrying out cyber espionage. A Kremlin spokesman for President Vladimir Putin said the Spanish claims were "groundless". They were "a continuation of the same hysteria that is now happening in the United States and a number of other countries". So did Russia seek to meddle in the Catalan referendum through "fake news"? Prof Javier Lesaca at George Washington University in the United States analysed more than five million shared social media messages from Kremlin-backed news platforms such as RT and Sputnik between 29 September and 5 October. He said his research had led him to "the discovery of an entire army of zombie accounts that are perfectly coordinated." Of the accounts studied, 30% were anonymous and dedicated to spreading content from those news organisations. Only 3% were real profiles. The study says RT and Sputnik participated in a "deliberate disruption strategy" over Catalonia. Headlines used emotive language to draw readers in, focusing on Spanish police violence against those who sought to vote in Catalonia's "illegal" referendum. Image caption EU fact-checkers accuse the Russian news agency Sputnik of spreading "fake news"
Reality Check: Were some of the police violence photos from Catalonia "fake"? The vice chair of the Socialists in the European Parliament, Victor Bostinaru, also says Russians may have meddled in Catalan politics. "Some of those behind certain online campaigns were in Russia," Mr Bostinaru said. Kremlin spokesman Dmitry Peskov hit back, saying "the Spanish authorities, Nato and the newspapers did not bring up a single worthwhile argument to back these claims". What has been going on in Catalonia? Some pro-independence Catalans have pointed out on social media that they hardly needed Russia to remind them of their grievances. A study from the Royal Elcano Institute, a Madrid-based think-tank, said news stories from pro-Kremlin outlets were part of "the Russian information 'war' in Catalonia", which it said "had the support of the Russian government". However, Klaus-Jurgen Nagel, an expert on nationalism at Pompeu Fabra University in Barcelona, disagreed. He said the Russian role had been "exaggerated by those who want to show that the only friends that the separatists have left have dubious democratic pedigrees, such as Russia, Venezuela and Cuba". Image caption Barcelona, 11 November: The Catalan slogan says: "Freedom political prisoners!" Francesc Pallarés, a political science professor at the same Catalan university, told the BBC that Russian reporting in Catalonia was part of wider rivalry between Russia and the West. "Russian media offer a perspective on Catalonia, based on their own geopolitical interests. These can be contrary to Western interests," Mr Pallarés said. "We are in an 'information war' based on the selection and presentation of information in both the West and Russia to create opinion favourable to the dominant interests." Spain has a long history of interference from abroad. During the Spanish Civil War in the 1930s Soviet Russia backed the left-wing Republicans - who wanted greater Catalan autonomy - while the nationalists were supported by Nazi Germany and fascist Italy. So it would be no surprise for Russia - seeing itself as a global power - to reach out to Spanish public opinion now. Several Russian news outlets have published Catalonia stories that the EU's East Stratcom Task Force labels as false. The Russian news site PolitExpert wrote a piece about how the Catalan independence declaration and the conflict in Ukraine were part of a plan by unnamed "global powers" to prepare the ground for a war in Europe. The EU fact-checkers described it as a "conspiracy theory". The Spanish-language version of the Kremlin-backed website Sputnik said the Balearic Islands had also called for a vote on independence from Spain. This is not true and the report cites one document from a minority member of the governing coalition there. 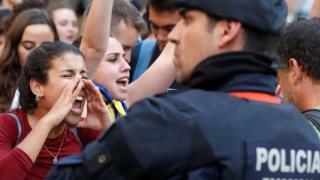 The Russian news outlet Vesti falsely claimed that Spanish was being taught as a foreign language in Catalonia's schools. However, the curriculum established by the Catalan government for secondary education differentiates between Catalan, Spanish and foreign languages.